Each year, Neopia celebrates Peophin Day on the 26th day of the month of Swimming, which is a great time for such a festival. People and neopets from all over Neopia gather round the rocky cliffs and sandy beaches to watch Peophins of all colors come to the shore and share their joy with the rest of us. It’s a unique opportunity to take a close-up look at these rare and magical creatures. Known to be shy and secretive, Peophins seldom mix with other species, but they’re famous for bringing fortune and good luck to those around them. So you should consider yourself really lucky if a Peophin chose you to be their friend, as happiness is bound to enter your neohome with them. I do realize Peophin Day is well behind us now, but I also happen to know that Peophins carry on celebrating for a long while. Besides, all days can be special neopet days, right? As per usual, The Neopets Team (TNT) celebrates by releasing new colors for Peophins on their special day. A few years ago (Y9 to be exact), Royal Peophins were introduced. Of course, there were both a Royal Boy (RB) and a Royal Girl (RG) Peophins. Needless to say, they looked majestic. Peophin enthusiasts rejoiced and history was in the making. I myself have a Royal Girl Peophin, and I can tell you, I could never been any luckier. It’s true I love all my neopets, but she holds a special place in my heart ever since the day I rescued her from the pound. The day I painted her Royal was a really joyous occasion. It’s a decision I’ll never regret, despite the somehow hefty price of the Royal Paint Brush, it’s a measly price to pay compared to the fantastic creature you’ll be having. I’m writing this article to let you know, dear reader, of the many reasons to paint your Peophin Royal, focusing on the most important ones. Ok, let’s start from the basics. Base colors, that is. 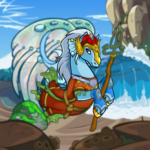 Once you paint your Peophin Royal, it will have a very special and elegant hue that sets it apart from other Peophins (and other neopet species, for that matter.) RB Peophins have a regal maroon color, complemented with an elegant violet mane, while the RG Peophins get a beautiful sky blue color with a shining light grey mane. We all know how Peophins often show up to lead lost ships back to land, and how they have magical powers that can heal injured or ill sailors, so these colors were chosen by Peophins to reflect that very nature. Maroon indicates vigor, elegance, refinement and leadership, while blue means truth, healing, tranquility, and stability. This is a subtle, but very important attribute in my opinion. While Royal Peophins maintain the same pose and stature of all other Peophins, there are a few noticeable differences. The last and biggest difference is the face plate itself. Both genders of Royal Peophins have those enhanced to cover a larger part of their faces, for more protection. Not only that, but they are made of gold, and encrusted with a round, rare gem, and an additional, smaller jewel, to indicate hierarchy and wealth. Since the transformation into Neopets 2.0, painting your pet a certain color now has its perks, especially an expensive and exclusive color, like Royal. These perks are dubbed “deluxe clothing,” which are simply items of clothing that can be removed from or added to your neopet, according to your own liking. When it comes to Royal Peophins, these deluxe clothing items are simply some of the most gorgeous, most elegant and most sought after. Once painted, the RB Peophins gain a navy blue, fur-lined cloak which is joined together at the chest with a big blue gem, and is adorned with a fine gold thread. They also get thick gold bracers -for those fierce battles- and two gold tail bands. The RG Peophins get more delicate, but equally elegant, clothing. There’s an Altadorian-style white cape, with golden design patterns. They also get leg bracelets, pearl earrings, a necklace and a small tail band, all made of gold, naturally. While deluxe clothes perfectly complement their look, some Royal Peophins prefer to donate them to less fortunate Peophins. 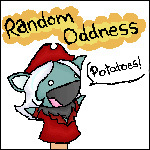 Oddly enough, when worn by “ordinary” Peophins, even basic-colored ones, these clothes can still produce a regal look effect. Try to slap a RB cloak on a red Peophin to protect him in the long cold winter nights, or a RG necklace on a green one when she has a social gathering. You would immediately notice the difference, which is due to the creativity of the Peophin craftsmanship. Ah, the infinite space for imagination. Where do I begin? Peophins in general are perfect for customization, with their long, slender bodies that allow them to wear shirts, pants, skirts and coats in the most gracious way. Hats and hand-held items look good too. Royal Peophins, in specific, look even better when customized.That is due to their base colors that provide a nice and balanced contrast with all the other colors, from white to black, ranging through red , blue, green, yellow and purple. So whether it’s an aquatic background, a long purple dress, or even a basic white shirt, you’d never go wrong with a Royal Peophin. Not to mention the gorgeous Peophin-specific clothing sets TNT have released over the years. Let’s count them, shall we? Carousel set: fit for a playful mood. The blue colors and the shells complement the RG Peophin well. Also, if you are financially able, you can even use some cross-painting (or trading, if you’re not) to give your Peophin some other look, like the Desert Helmet for a Lost Desert Royal (think Peopatra), the Pirate Coat and Hat (long live The Pirate Peophin King), or even the Island Garland (it’s so fun to be a Tropical Royal). There are no limits here, really. Take all of the above and add them to the hundreds of backgrounds, foregrounds, trinkets and fit-for-all-species clothes, and your Royal Peophin will be in for a real treat!! I might be not much into role-playing myself, but I know that lots of Neopians are. Royal Peophins give you that edge you’ve been looking for. But even if you’re not into role-playing, they will give you a reason to write a back-ground story, if you're designing their look-up or pet-page, or at least they would make an interesting, ice-breaking conversation starter with other Neopians. Trust me; most people, even total strangers, will compliment you on having such a majestic creature. They’re full of character, attitude, and personality, and with the proper name and customization, your Royal Peophin can be anything you want it to be. For example, I gave my RG Peophin, Peopha, a Warrior Queen character, using only some customization and a simple background story. You can use the above list (reason number 4) for yours. Your Peophin doesn’t even need to live in the sea for their role-play character to work. Role-players and Neopian writers: get ready for endless fun and story-time. If you are a trophy hunter and enjoy seeing your name in the limelight, your Royal Peophin can help you win many trophies; for them and for yourself. With all the options above, they will be a notable neopet in no time. Use your creativity and they can also win the pet spotlight, customization contest, beauty contest, and can be featured in the art gallery, poetry gallery, and even the Neopian Times. So go ahead, use that paint brush, open the windows to your wandering mind, and let your Royal Peophin take you into the magical depths of your imagination. They are very well capable of that.